When cases double as hand-free stands, they’re normally designed for landscape viewing. With STM’s implementation for the iPhone 6, however, the company has opted to go with an unconventional scheme with its STM Harbour case. In terms of visual style, there’s really nothing that stands out too profoundly with the STM Harbour case – its two-toned, separating color scheme is just generic. Our particular model, the charcoal accented one, is somewhat bland to our liking. However, the company offers it in some flashier colors, such as green and dark red, that definitely pop out significantly more than our particular unit. 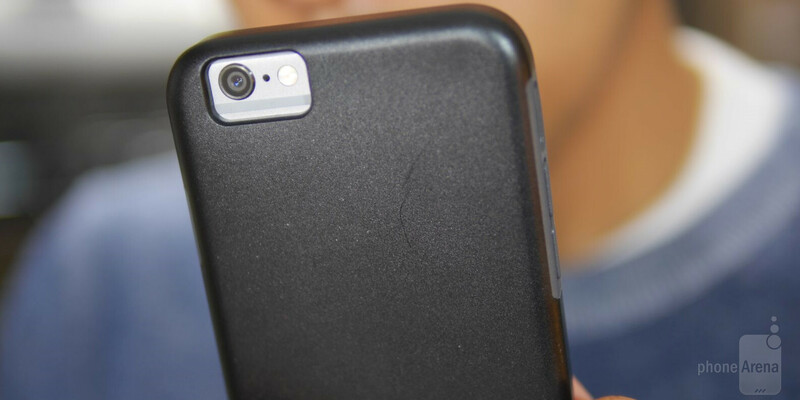 Comprised out of this dual density thermo polyurethane material, one that features a tight fitting on the iPhone 6 and a matte finish, it’s a sturdier feeling plastic material. Certainly, it’s not the softer, more rubbery material we tend to see employed by other cases in its price category. On one hand, we appreciate the sturdier feel of the case, but on the other, it makes the volume controls and power button stiff to the touch. In addition, the cutout around the 3.5mm headset jack isn’t as wide to accommodate those larger sized headphone cables. Now, the bottom section of the STM Harbour Case has a hinged design – one that allows us to prop up the phone for viewing. Honestly, though, it’s not all that practical for using the phone hands-free because it’s barely exhibiting a wide enough view. Rather, it’s more of a feature that merely acts as a propping tool to show off the phone – and that’s all. For the $24.95 you’ll need to shell out to pick this one up, it’s not too bad of an investment, just as long as you find its design favorable looking. Then again, its unconventional hand-free stand offering is just not as useful as we’d like. You make 200 reviews on cases for iphone 6 but no review on phones that deserve one. That is not right. *i could give you 20 phone at least,that dont have even an article dedicated. You sound mad, bro. If you don't like it, I'm sure there are a million other sites you can visit that will give you what you want. It's not that! Not at all man i have not somethink with your site but i can tell what i think for anythink. I d'ont want to disrespect you or anybody and i'm really sorry if .... This phone is dis respectable on many ways, Cracking, Espionnage, CLOSED, very expensive and it's not giving you what you paied at all. And for many many other thinks but i let the others search for what i Just say and tell. That's it. Why did you respond as if you are the other guy? Do you have 2 accounts? Everyone is entitled to an opinion.Even you. Put other cells here this is the badest the most decadant ever. We dont recognize this fuc.... faillure! Do you guys every like any case you review? I've rarely seen one get above a 7.